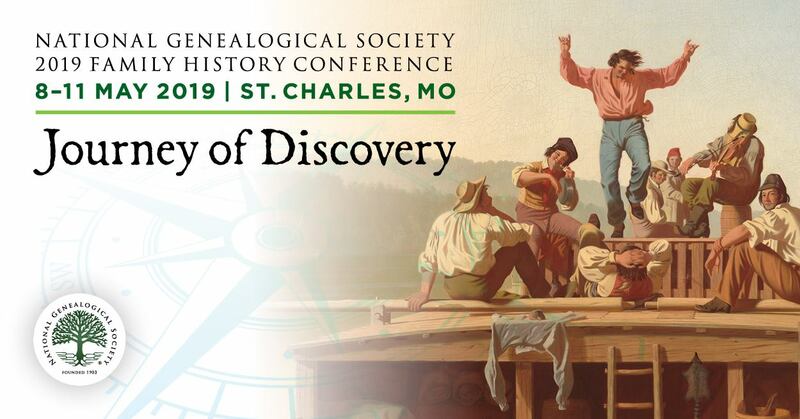 Friday (11 May) -- NGSQ 100th Anniversary reception, 5:30 until 7:00 p.m. will highlight the centennial anniversary of this premier genealogical journal. Emphasizing scholarship and genealogical problem solving in a clear, readable format, the NGS Quarterly sets the standard for genealogical excellence. The celebratory event will feature exhibits focusing on the history of the publication and influential individuals who have contributed to its success throughout the years. Admission to the event is $15. Saturday (12 May) -- NGS Annual Meeting, 5:15 p.m. -- This is an opportunity for NGS members to meet the NGS officers and board members and hear an update on NGS programs, courses, and publications from NGS President, Ann Hilke, cg. Editor’s Note: These are published here as suggestions. There may or may not still be openings for the reception (as you read this) and ask at the registration desk. Just learned from NGS FB page, https://www.facebook.com/ngsgenealogy that tickets for tomorrow's NGSQ Reception are available until 2pm TODAY!!! So, get yours now if you are interested!